Koinonia is a biblical Greek word whose primary meaning is “fellowship, sharing in common, communion.” The word occurs 20 times in the New Testament and the first occurrence can be found in Acts 2:42 “And they continued stedfastly in the apostles' doctrine and fellowship, and in breaking of bread, and in prayers.” Christian fellowship is a key aspect of the Christian life. Believers in Christ are to come together in love, faith, and encouragement. That is the essence of koinonia. Koinonia is being in agreement with one another, being united in purpose, and serving alongside each other. Our koinonia with each other is based on our common koinonia with Jesus Christ. That is what true biblical koinonia should look like. 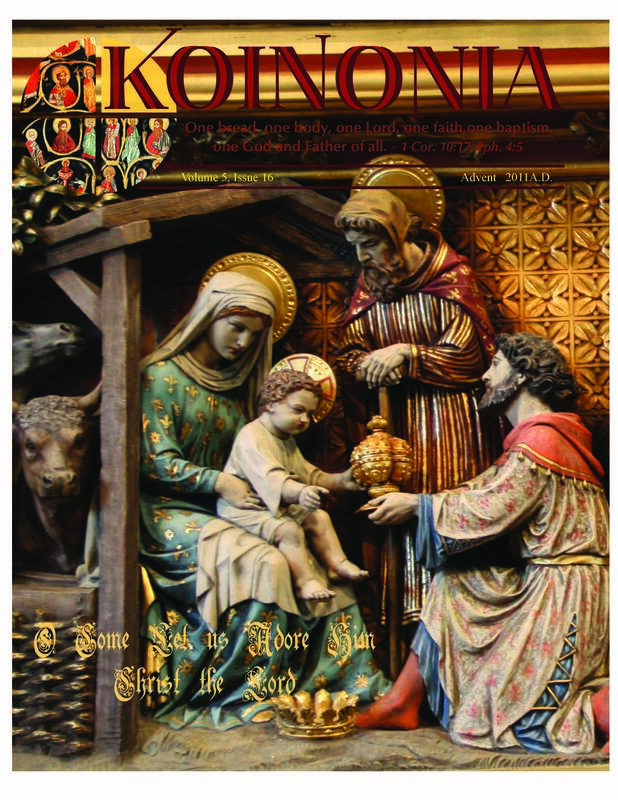 That is what we had in mind with the creation of our Provincial newsletter Koinonia. 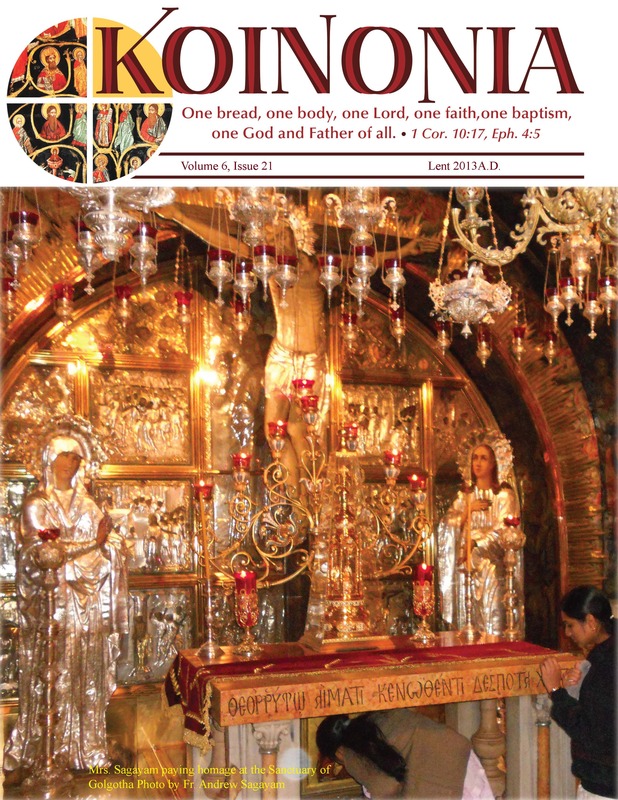 Our prayer is in agreement with our Lord Jesus Christ as expressed in His high priestly prayer in the 17th chapter of the Gospel according to St. John the Apostle beginning at the 21st verse: "That they all may be one; as thou, Father, art in me, and I in thee, that they also may be one in us: that the world may believe that thou hast sent me. "We preach none other gospel but that which has been delivered unto us. There is amity and communion with those who are like-minded." 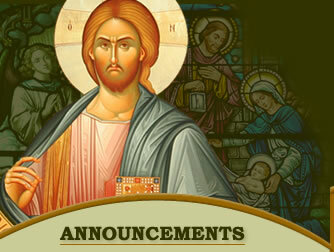 Comments and suggestions for Koinonia may be sent to koinonia@holycatholicanglican.org. 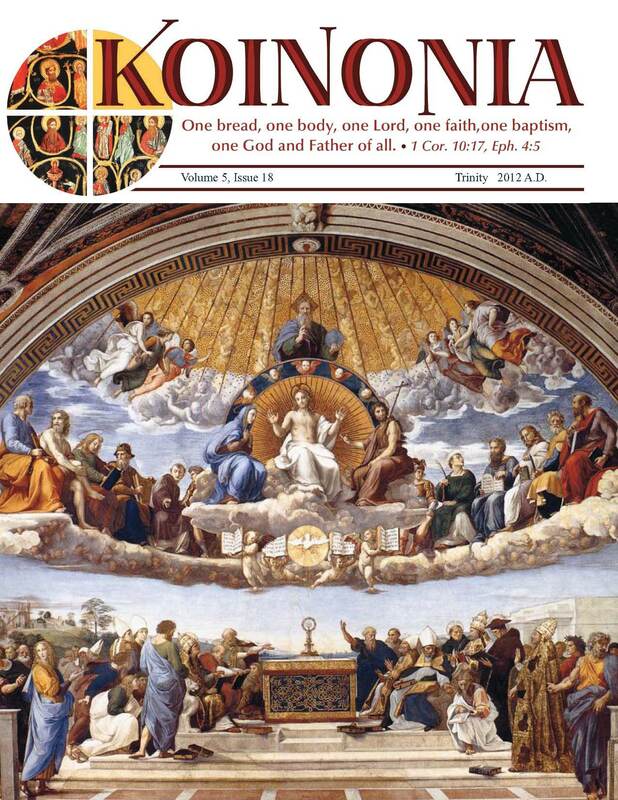 In the Koinonia masthead, the circle with the cross in the center symbolizes the paten and the diverse elements which form a whole. The Mosaic represents the great cloud of witnesses and the church tradition. The red in the letters represents the blood of Christ with the font comprised of individual pieces of letters that are not joined until the blood unifies them. 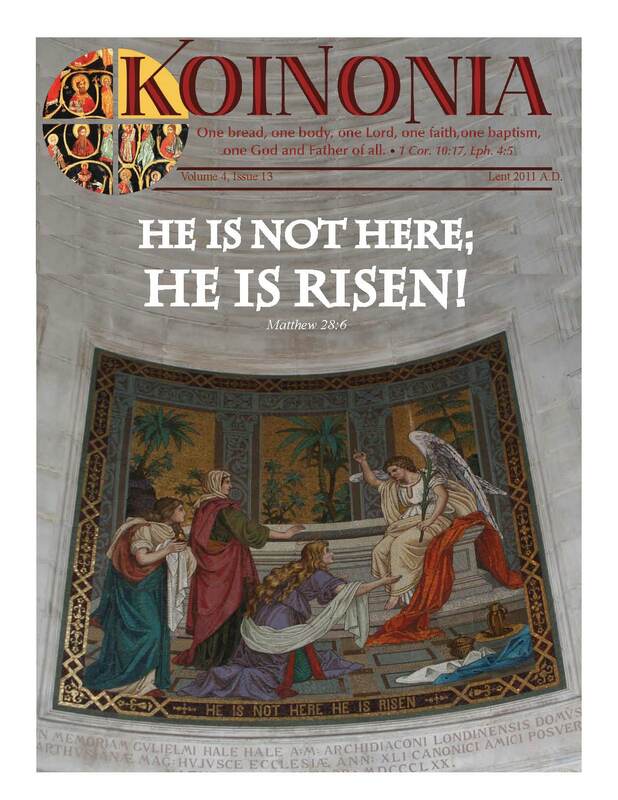 Please click here for comments and article submissions regarding Koinonia. Lent 2013 Koinonia dwells on of SIN and REDEMPTION by Bishop Edmund Jayaraj, Sin and Redemption,a great article by Bishop Charles Gore, the Anglo Catholic Bishop from the early 19th century that reverberates even in 2013, The need for Confession from the Holy Cross Publications, The Pilgrimage of Fr. Andrew and his wife Alphonsa to Holy Land, the great article on Anglican priest George Herbet by Canon Patric Comerford of Dublin, and guest articles. Donï¿½t miss out the ï¿½Cï¿½mon manï¿½ - how God is frustrated with our conduct and our wandering away like lost sheep - great articles for Lenten Reading. 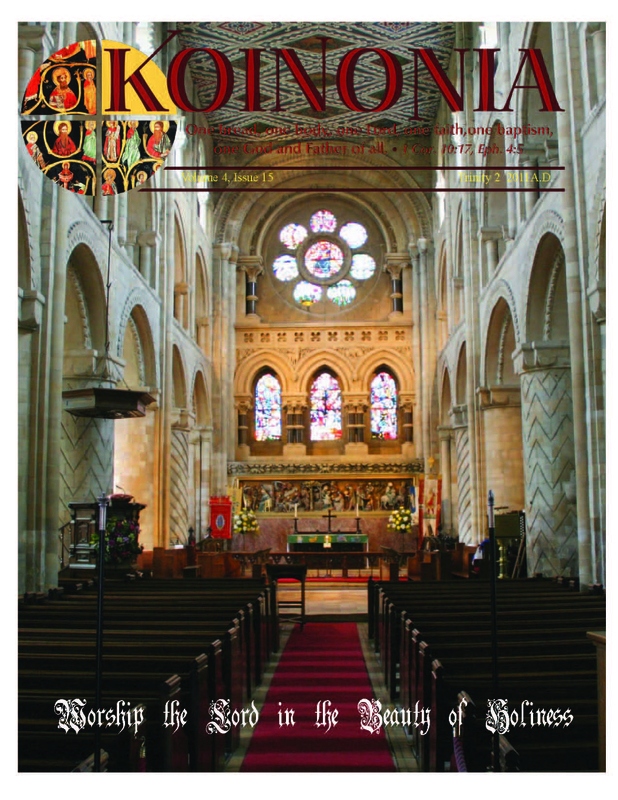 NEW* TRINITY II issue of Koinonia:The current Provincial issue of Koinonia focuses on the Catholic Heritage of Anglicanism and AngloCatholicism in the Apostolic Succession and Tradition, Finding Hope in Greece, Living Water, On Worthy Reception of Holy Communion, Note on 39 articles,Render Unto Caesar...To God's greater glory! 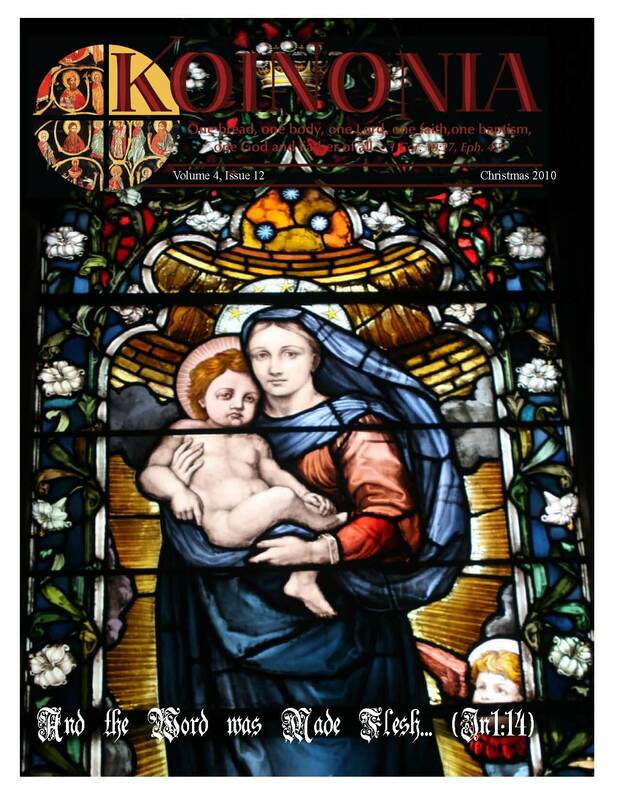 TRINITY I issue of Koinonia focuses on the Diocesan and Provincial Synod of 2012 in Casper Wyoming. 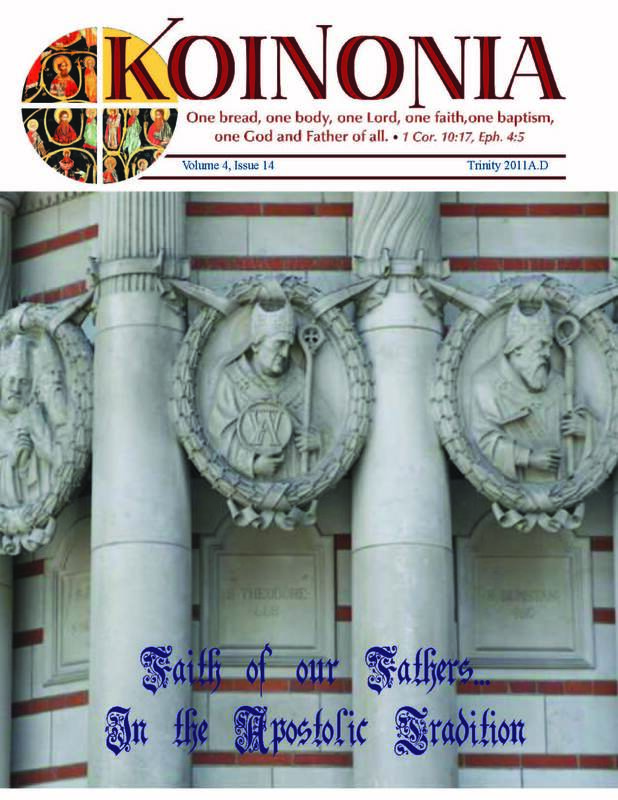 This issue celebrates the blessings of God to our church. May His Name be glorified! 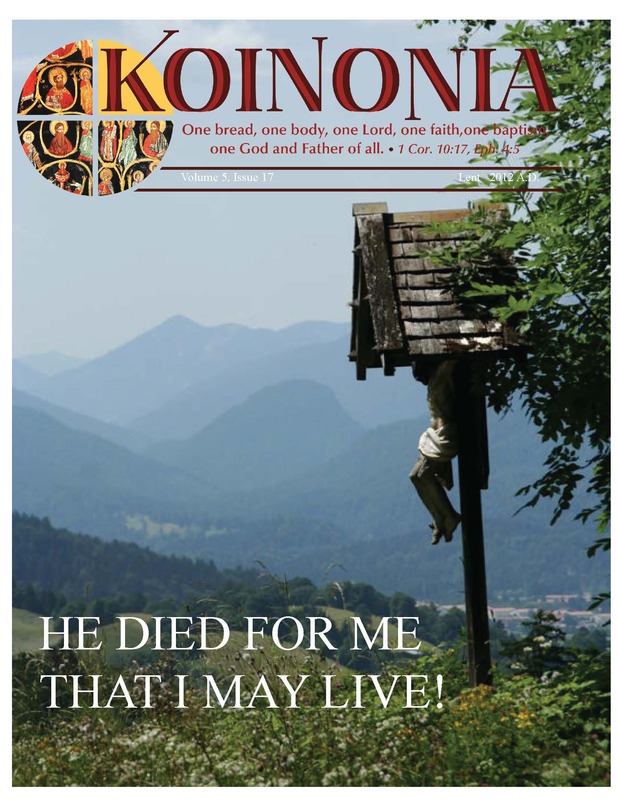 Lenten issue of Koinonia on Sin according to Scriptures,Conscience, Sacrament of Absolution in the Anglican praxis,Reflection on Psalm 51, Eucharist. 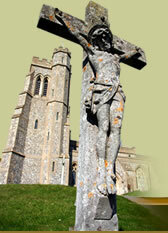 Right to Life - great themes that fit the Holy Season of Lent. 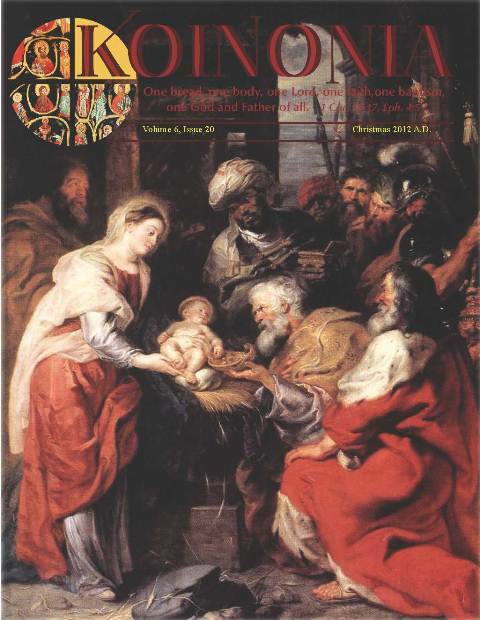 ADVENT 2011 of Koinonia - Reflection on the Holy Season of Advent by Canon Patrick Comerford of Christ Cathedral Dublin,and a tribute to the 400th anniversary of King James Version with Apocrypha by Canon Owen Loftus of HCCAR. The Diocese of Holy Trinity & Great Plains' 2011 Synod, The HCCAR Provincial Synod, The Consecration of Bishop Edmund Jayaraj for the Indian Diaspora, The Wedding of Deacon Michael and Mellissa Rush, a great moment of the provincial gathering with the Great Commission of our Lord as the guiding principle. 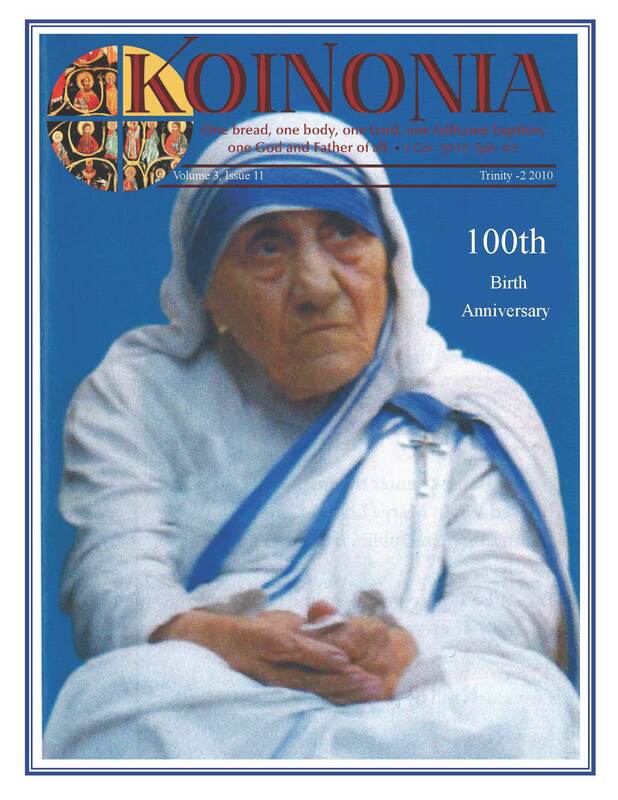 This issue is a dedication to Mrs. Madelyn McNeley, a strong pillar of this church, Mrs Beatrice, granddaughter of Fr. John Roberts the first episcopal missionary of the American Indian Mission 0f 1800s,Announcing the Episcopal Consecration of Bishop Elect Edmund Jayaraj (from the stock of Bishop Azariah, the first Anglican Bishop of South India) for the Missionary Jurisdiction of Indian Diaspora,and Lenten reflection featuring the Anglican Poet T.S. Eliot's "Ash Wednesday" by Canon Patrick Comeford. 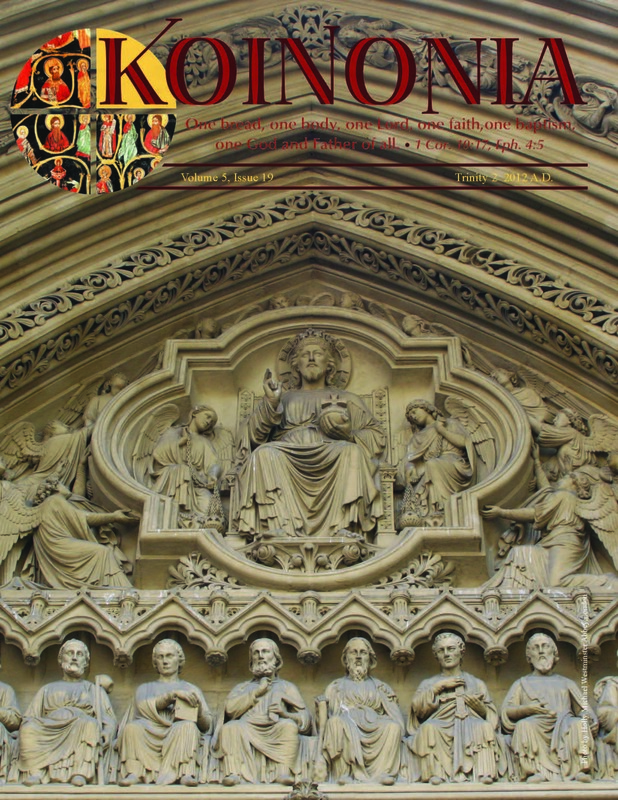 This issue of Koinonia is a look into the past as to who we are - taking us back to the roots of our Anglo Catholic Faith featuring articles on the 19th Century Oxford Movement and the 20th Century Congress of St. Louis - preserving the faith once delivered unto the saints. A must read- great historic documents in your hand.